How will NFTs change games? Games and crypto-collectibles will lead the way to mainstream crypto adoption. Crypto offers two new building blocks to the game developer. First, smart contracts allow developers to create publicly verifiable rules, users can connect with one another globally without being hindered by national borders, and money for transactions is built in to the protocol. Second, non-fungible tokens (NFTs) provide provably scarce, programmable, and censorship resistant digital goods. These building blocks will enable developers to augment existing game formats as well as create new game formats. Today’s crypto games are highly focused on experimenting with NFTs. 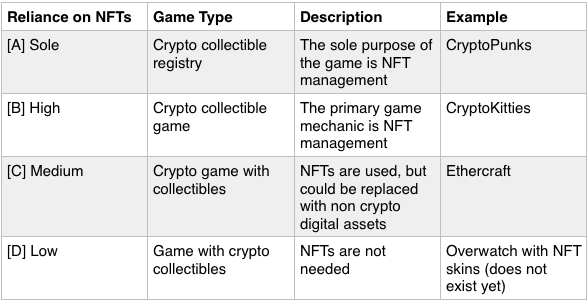 In this post, I want to ask the following question: what impact will NFTs (or crypto-collectibles) have on games? What are all of the possible uses of NFTs in crypto games? We can describe all games that use NFTs by defining categories by degree of reliance on NFTs. Sole reliance on NFTs [A] refers to a game that stops and ends with collecting and managing NFTs. Low reliance on NFTs [B] means NFTs can be used but are not needed as part of the primary game mechanics. These are the first games we started to see. Notable examples are CryptoPunks and the original versions of CryptoCelebrities and EtherTulips. The creator of the game issues an NFT for each item in a thematic set (e.g. Punks, Celebrities). Users can make money by buying and selling these NFTs. While we’ve seen substantial trading volumes for some of these games, we’ve yet to see this type of game maintain longevity. To combat this, many games that started as [A] games have added functionality, which leads us to crypto collectible games [B]. These games take crypto collectible registries [A] and add either gameplay or game worlds. The canonical example of the category is CryptoKitties. CryptoCelebrities and EtherTulips mentioned in the previous section have also added gameplay since launching. Etheremon and Etherbots are other popular games in this category. Today, gameplay is simplistic: battling, breeding, and other straightforward rules and interactions. This functionality will advance rapidly, as game developers experiment with rulesets and interactions that keep players coming back. Note that while many games in this category today look very similar, many dApps in this category might look like nothing you’ve seen before. One could argue that Decentraland falls in this category. Users collect and manage LAND and can build dApps + VR worlds on top of them. There’s a core use of NFTs plus functionality. In this case, the functionality is vast. These games focus on crypto-enabled gameplay that go beyond speculating on crypto-collectibles. Collectibles enable the gameplay, but they could be replaced with non crypto digital assets and the game could still be played. The only live game I’m aware of that I’d put in this category is Ethercraft. 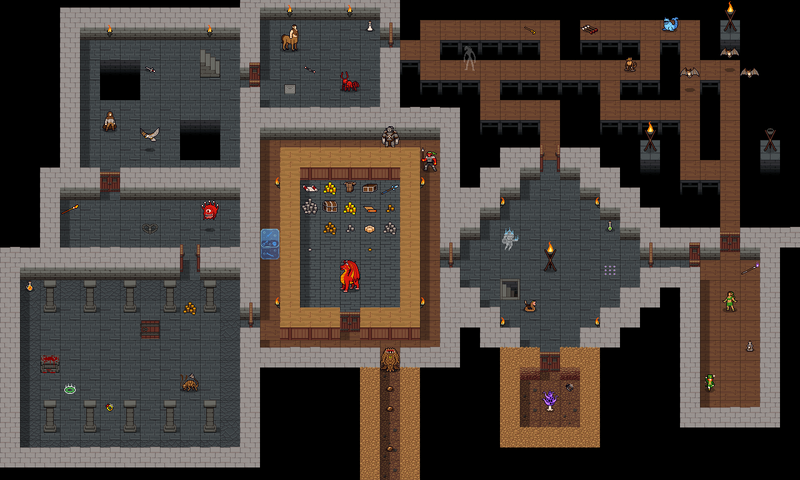 In this game, you run dungeons with a hero you equip with various items. These items are all NFTs and can be found, bought, or crafted. However, one huge limitation we need to overcome is the friction of crypto transactions. The user has to pay a non-trivial amount of gas every time they make an action. This is easier to justify in [B] where there’s a clear upside to an infrequent action like breeding or battling, but much harder to justify when you start to think about all the actions you might take in a casual game (e.g. watering plants). Would a farmville player tend their farm if every action cost a dollar and took minutes to propagate? I don’t think they would. I’m sure there is a plausible path to enable these transactions, but I’m not sure how much decentralization we’ll have to trade for it. For example, we may discover that these games don’t work well on top of Ethereum, but work great on top of a lower decentralization, higher throughput protocol. These are non-crypto games that incorporate crypto collectibles. The most popular games today have some loot mechanics where users can earn items that aren’t core to gameplay. The easiest example of this category is a non-crypto game where you can earn NFT skins. In the short term, the biggest game developers (e.g. EA, Blizzard) are unlikely to incorporate NFT skins. They’d likely lose money because they already have permission from their users to create digital value out of nothing. Smaller studios might differentiate themselves by offering NFT skins — this would be strictly better for users because they actually own their skins. Hoard exchange is working on making it easier for game developers to accomplish this use case. User preferences will drive this category. If enough users start to demand ownership of their digital goods, the industry will follow. What’s missing from this framework? Many crypto games are not accounted for using this breakdown. For example, prediction markets (e.g. REP) and gambling (e.g. FUN) could be considered games but don’t fit in any of these categories. That’s because these games don’t use NFTs. Looking at only NFTs doesn’t give you a full picture of how games will be impacted by crypto. The degree to which NFTs are used is only one dimension. The other important dimension is the degree to which a game is decentralized. For example, a game could use smart contracts to enforce game rules but have no NFTs. Or a non-crypto game could use decentralized voting to make development decisions. How will game NFTs evolve? Today, we’re seeing rapid experimentation in games that focus mostly on collectibles (A and B above). Functionality is limited and as a result, the games aren’t that fun, leading to high user churn. We’ve yet to see a crypto game playable in a game world. Right now, there’s no “setting” to games. You have game assets and game functions, but no world that everything is set against. Setting is both the literal backdrop of the game (e.g. map of a Dota2 game or the farm in farmville) and the overarching lore and universe that places the game in context and gives it additional meaning. The literal backdrop today is a simplistic web3 browser interface. It’s easy to imagine the evolution to resemble games we play today in browsers, mobile apps, and consoles. This is a problem we’re working to solve at Decentraland — we want to add richness to otherwise simplistic games by providing the tools to create an immersive game world. In the near term (3–6 months), I expect to see category [A] phase out (save for a few huge winners), category [B] to balloon, and continued experimentation in category [C]. The success of category [C] relies in large part on improving the user experience by reducing friction, increasing throughput, and reducing confirmation times for transactions. In the long term (one year or more from now), you can expect to see the emergence of category [D]. Over a long enough time horizon, every in-game item will be an NFT. The gaming market is worth over $100B and growing rapidly. NFTs have the potential to penetrate existing game categories as well as introduce new types of games. Because of their natural properties, successful adoption of NFTs in games could lead to an explosion in value transacted, substantially increasing the size of the gaming market. We’ve already seen millions of dollars transacted in today’s rudimentary crypto games. Given current rates, we should see over $1B transacted this year. Which of these categories of games will be the most popular? To what degree is adoption of these games dependent on technology improvements (e.g. scaling)? Will incumbent game developers adopt crypto? To what degree? Looking at games on a scale of NFT reliance is interesting — what about decentralization?